My Weblog: Chips and chocolate. 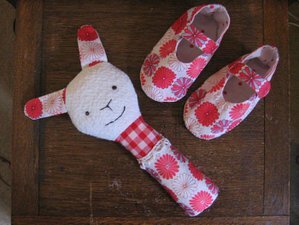 The shoes need a bit of red stitching, the bunny has a tummy stuffed with dried lavender, so the other side of her will have a sleeping face - hopefully this will encourage baby to nod off too. ? The flowery fabric is Liberty, I think it's called Kinnear - aint it pretty ? The boys are away for the weekend, so Molly and I are going to have a lovely girly time, she'll be staying up late and then sleeping in my bed. We'll be having fish and chips and chocolate for tea and painting our toes red. Here's wishing you a lovely girly evening too. I don't know who's cuter, Molly or Mrs. Tippytoes - Molly wins by a nose in the photo-finish, but Mrs. Tippytoes is only behind by a whisker. Ces petites chaussures en "Kinnear" sont une pure merveille ! adorable! yeah, ms. molly gets my cutie pie vote for the day! Oh, those shoes are adorable. I've been eyeing that Liberty fabric for awhile now...so pretty! Have a fun night with Molly! That bunny and those shoes are adorable. What a really lovely baby gift. Aw, I love the shoes and the bunny! And Mrs. Tippytoes looks like a great entertainer. The photo of Molly holding her is adorable! I think I'll be dreaming of tea and chocolates and beautiful fabric and adorable baby shoes. Great plans. Enjoy your weekend! Please keep letting us share her? that fabric is wonderful and the shoes are beautiful. oh goodness. girl + kitten in blankie are mortally cute. aiaiai. but also, the rattle and the shoes. must.stop.finding.new.projects. oh wait. who cares! thanks for the inspiration. I used to love those girls nights. great shoes and bunny.Please will you show us the finished products!I like your idea to put lavender in the body. Have a gorgeous girly weekend. Aw, the shoes and bunny are so cute. Lovely fabric! Love the dear little shoes! Sweet sweet sweet. so cute. I have been wanting to try shoes, but I am afraid. Were they hard to do? I love this Liberty print, one of my favorite! Beautiful shoes, love the toy too! The shoes are beautiful and the bunny is adorable! I hope you had a wonderful weekend! Oh they are gorgeous and with lavendar, mmmmm, what a lovely idea. 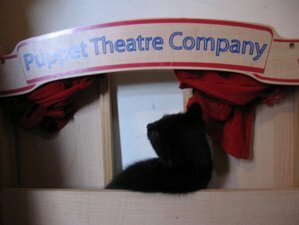 Hope Mrs Tippytoes stage debut went well and that she doesn't become too much of a diva. And your girlie evening sounds simply wonderful. OMG! You're killing me! The shoes! Mrs. Tippytoes! Girly night with fish and chips and chocolate! All in one post. The bunny is filled with lavender! Did I mention the shoes? I'll just go and babble and drool to myself now. Ohh they're adorable!! And the lavender is a lovely idea! I love those shoes! They're adorable. Hope you had a nice girly night with Molly. okay, that picture of Molly and her precious babe is just too cute!!! You better get ready for some more "boredom" pushing swings in Portland soon baby!!!! Let's make a date for 2007! Love the booties and bunny! So cute. les chaussons sont superbes, y a t-il un patron (a pattern)???? I'm a french woman and my english is not very good I'm so sorry ! Please excuse me ? WONDERFUL THINGS and pictures ! I had got a teater like you and I made color with item Tricia Guild you could see it if you want on my eblog in the pictures : "couture : côté belette" Belette in franche is fairy in english because I'm waiting a baby !! Excuse me for my bad english ! i love those tiny shoes!! i have a pretty lil molly too!